The picture was painted in 1884 in oil on canvas. Artistic style – realism. Shishkin’s paintings are masterpieces that are filled with love for the expanses of our Motherland. His work includes dozens of canvases depicting landscapes of forest dwellers. On the plots of his paintings created a lot of poems. The last decades of the 19th century were for the artist the flowering of his work. During these years, the most pictures were created, and all the plots are devoted to the Russian forest. Shishkin put his love and soul into it. He glorifies the beauty of his native land and shows it to us. Shishkin is disturbed by all landscapes: experiences for the forest cemetery, admiration for the changing seasons of the year, etc. Every year, in the fall, nature seems to die, and in the spring it begins its new life cycle. 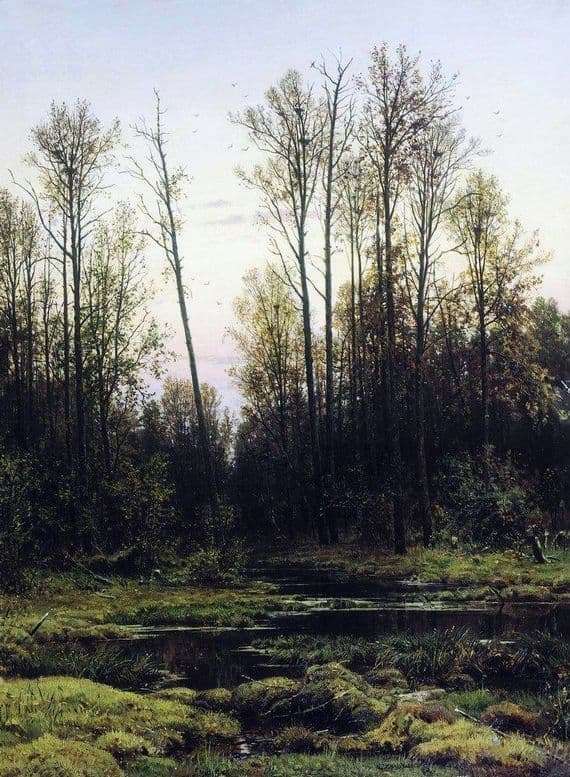 The canvas “Forest in the Spring” – is one of the paintings dedicated to Russian nature. Most often for his work, Shishkin used the northern landscapes. The trees still have no foliage after hibernation. The snow melted, leaving behind a everywhere swampy surface. In the sky you can see birds returning to their homeland, and very soon they will build new nests here, life will appear. Young grass makes its way across the meadow, solemnly looking out of the ground recently covered with a thick layer of snow. The warm, spring sun breaks through the rare and leafless crowns, announcing all life on a new stage. Looking at this landscape, the soul will be filled with warmth and joy. There is a desire to find such a place and spend the whole day there. Another work shows the skill of the author. Artistic techniques help make the landscape realistic. Work done very subtly with amazing color. Another work of the great artist shows the majesty of Russian nature. The canvas is stored in the Serpukhov Historical and Art Museum.